Morgan James Faith, 9781642791938, 190pp. 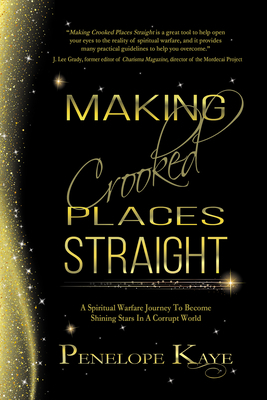 Making Crooked Places Straight is a spiritual warfare training manual, equipping believers to walk in victory over the perverse spirit. Everyone wants to shine like a star, but not everyone is willing to pay the price. Because in paying the price, all come face to face with the perverse spirit in his or her life. Since the church has, for the most part, relegated the perverse spirit to the homosexual community, most Christians have no clue how the perverse spirit works in their lives, homes, or churches. Making Crooked Places Straight solves that dilemma by providing information, insights, and answers from a solid biblical base. Writing an expos of the perverse spirit in the form of a training manual, Penelope Kaye teaches readers how to recognize and overcome this twisted serpent with prevailing prayers, practical tools, and powerful weapons. While experiencing a roller coaster of emotions, believers find the strength to press on and realize God will see their crooked places made straight and they can then truly shine like stars.